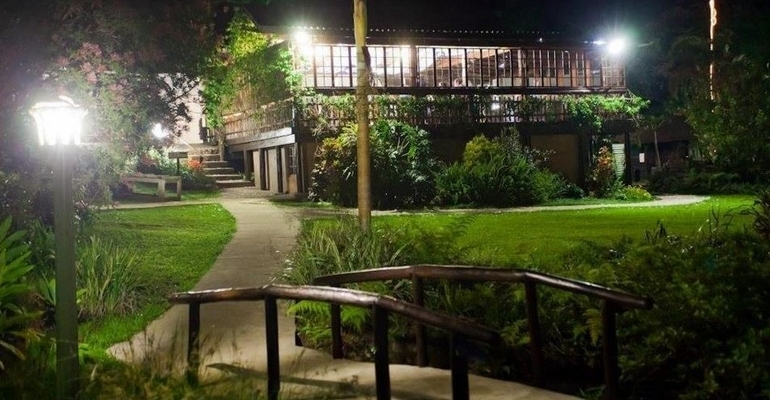 Nestled in the lush vegetation on the banks of the Umtamvuna River, you will find the Umtamvuna River Lodge. The lodge offers accommodation in eight comfortable air-conditioned and heated en-suite double, twin or single rooms. Each room has a flat-screen LCD TV, selected DSTV and a private balcony which provides the opportunity to relax at sundown while taking in the views of the river and surrounding mountains. Spend relaxing moments at the pool terrace or drinks at the cocktail bar, which stands on stilts near the river’s edge, while you watch the wakeboarders in action on the river. Take a relaxing walk through our tranquil sub-tropical garden or play with the kids on our private river beach. If you are looking for a bit more excitement, there are also plenty of activities that both the Lodge, and the surrounding attractions, have to offer. Umtamvuna River Lodge is also South Africa’s premier wakeboarding venue and home to some of the best pro wakeboarders South Africa and Europe has to offer. Beginners and professionals can wakeboard in warm tropical conditions year-round on the flat water behind a Mastercraft X-star with personal instruction by Kevin Dry and other top international pro wakeboarders. Plenty of nearby activities and attractions.